The Honda FCX is Honda's first hydrogen-powered fuel cell car to go into production. Along with unique ways of arranging the fuel cells within the vehicle, Honda have developed an innovative way for obtaining the hydrogen necessary to fuel the FCX, called Home Energy Stations. The Home Energy Station generates hydrogen on-site in your garage, converting it from readily-available natural gas. Not only would you be able to use that hydrogen for the vehicle, you could also use it in fuel cells that would provide electricity for your house as well. Tanks positioned under the cars boot will hold enough hydrogen to give the car a range of 350 miles. Honda says this system can save 50% on not only vehicle fuel bills, but household electricity, too. 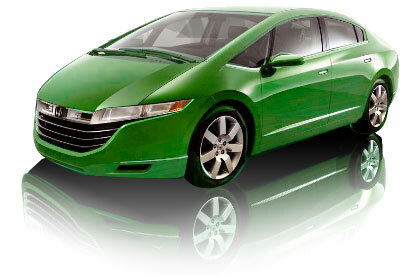 The FCX Clarity transforms hydrogen fuel to electricity using a new Honda proprietary fuel cell stack. The cells' power density is said to be up by 50 per cent on previous cells, but the stack is still - as in most fuel-cell vehicles - hybridised with a li-ion storage battery to cope with acceleration, hill climbing etc.